Board games never really go out of style do they? 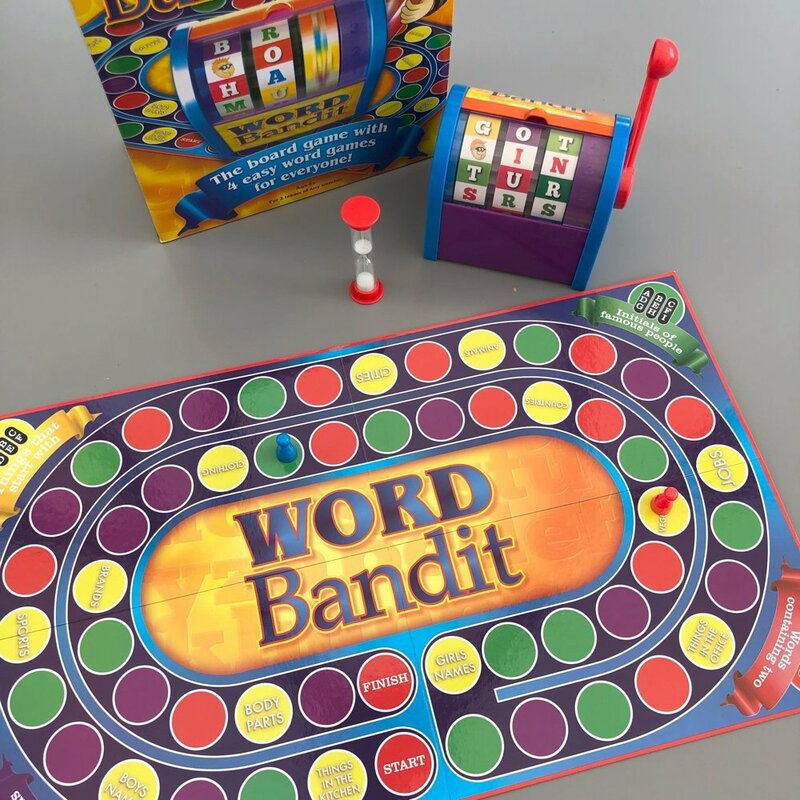 They’re great for gathering the family around the table together and getting just a little bit of a competition rocking and Word Bandit the new game from Drumond Park is perfect for that! 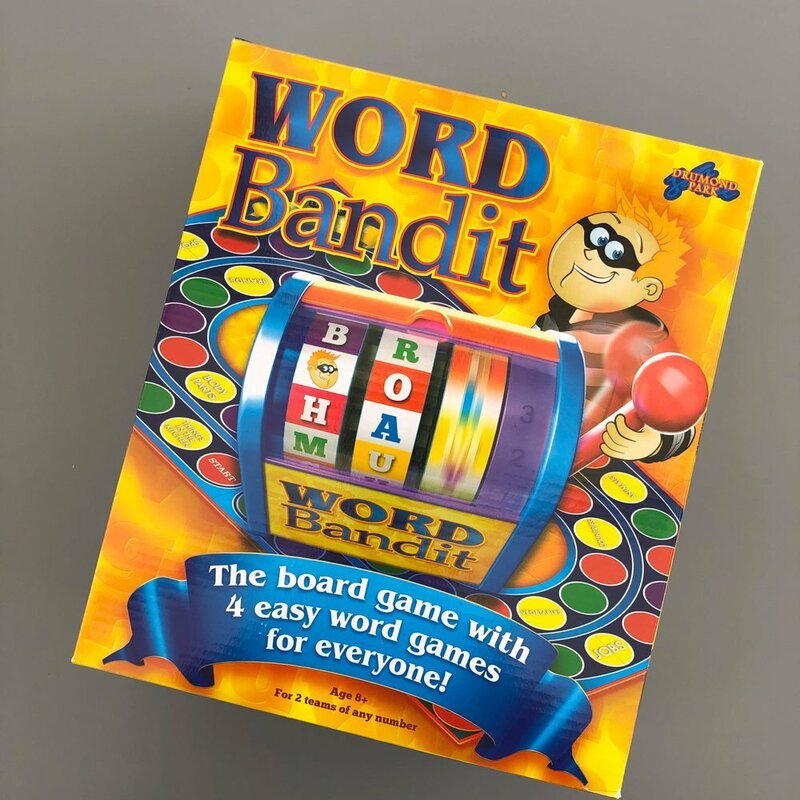 Word Bandit is actually a super simple game to get the hang of and is essentially 4 games in 1. I’m not going to run through all the rules word-by-word because they’re simple enough to follow once you get the game. The aim of the game is to be the first to navigate the board and reach the finish first. To play the game you work through the word puzzles – each colour of square has a different type of word puzzle to play and you play against the clock – flipping the egg-timer and answering as fast as you can to score the highest. To get your letters for the word puzzles you pull the handle and spin the word wheel which reveals a grid of letters for you and your team to play with. The game on the purple squares involved 4 rows of letter and you have to find as many words as you can that wind around the grid – any direction goes – the letters just have to be next to each other – up, down, left, right or diagonal. The game on the green squares is played with 3 rows of letters – you have to find the initials of famous people amongst the letter grid. The game for the red squares is super simple you just need to think up words that contain any 2 or even 3 of the letters on the letter grid. We loved how competitive the game is – it’s a great team game. Super simple and fast to set up. A great game for family game nights. A great Christmas gift for older kids. Disclosure – the Word Bandit game was sent over free of charge for review. For full details of my disclosure policy please read here.